I will send a copy of the contract when interest is shown in a puppy. All of our puppies come with a 1 year health guarantee against life threatening genetic defects. If using PayPal I will e-mail you an invoice requesting a payment for deposit through PayPal. You do not need a PayPal account - only a current e-mail address. You can pay with a Visa, Mastercard, or Bank Debit. Important concern when selecting your puppy is the pups temperament. 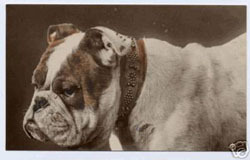 Warlander Bulldogges does not own or breed Bulldogges that are aggressive. Our puppies are raised by the family, for the family. It takes a firm but gentle and consistant hand to raise these pups. We always recommend Obedience training as a puppy from a professional dog trainer. Bulldogs are a very powerful breed. They need a pack leader and consistency. Quality is expensive! You are not purchasing from a fly by night kennel, with no or very little experience and bargain priced puppies. You are buying from a careful breeder who breeds "temperament first" and health first. We pride ourselves on our healthy puppies and in depth knowledge of the OEB. Call Sonya Moore 352-978-5164. We provide pictures when our puppies are of age to best represent their potential for interested buyers. This is normally at 3 to 5 weeks of age. I price each puppy individually based on their particular overall conformation. Other factors in pricing include markings, parents, age, size, even time of year. We do not have a set price for males and females each puppy has it's own price. Our pricing varies from litter to litter and even within litters. The price includes breeding rights and there is no discount for pet only or no papers needed. Once our pups are posted for sale it is strictly a first come first serve option. Our website is updated weekly. We do not consider a puppy sold until a deposit or payment is placed. Please note that we have many inquiries and phone calls on individual puppies and are happy to answer all questions you may have but cannot consider a puppy sold until an actual deposit of $200 has been placed on an individual puppy. We do try our very best to return calls and messages in the order received in an order to be fair to everyone. Unfortunately we have had to answer many disappointed callers or emailers over the years who are told the pup they have been inquiring about has now been sold and is no longer available. So if you are wanting a certain puppy make a deposit ASAP otherwise the next time you email or call the pup may be sold! Once a deposit is received by Warlander Bulldogges the puppy is considered sold and a contract made between buyer and seller. The puppy will be marked and indicated SOLD at that time on the site. The balance of the purchase price would then be due when your puppy is picked up or 48 hours prior to shipping. If the buyer defaults on the sale the deposit would be considered non-refundable as the sale of the puppy would have then be delayed and possible sales lost. We are able to accept cash, Mastercard, Visa and Discover for your convenience, through PAY PAL, as well as PayPal under the email: babbybullz@yahoo.com. You no longer need an actual PayPal account to pay by credit card, through PayPal. Just click on the Payments link and hit the Pay Now button, then either login to your account or hit the link for paying by credit card without a PayPal account. If you prefer to mail the balance payment, we accept bank cashiers checks and postal money orders but the payment must arrive within 72 hours or the puppy is naturally considered available for sale once again and payment is assumed not arriving as promised. Please take the time to do your research on this wonderful breed. If you are "genuinely interested" please call or e-mail for a copy of our puppy contract.